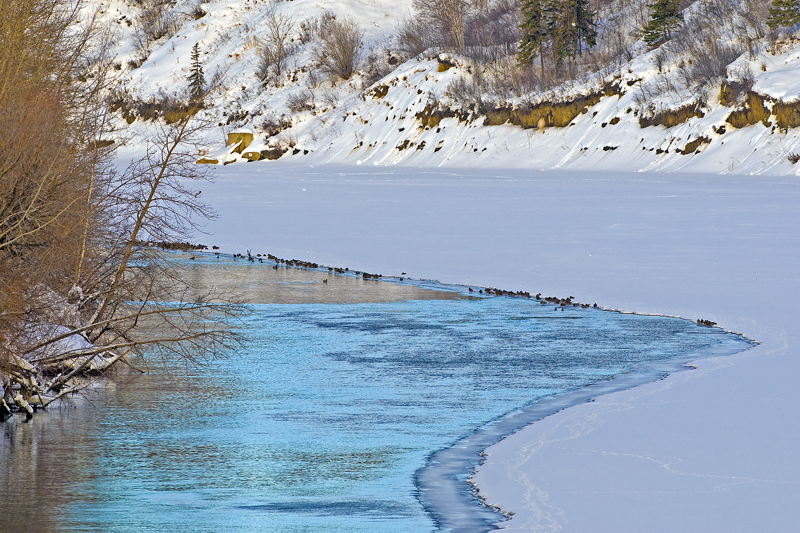 On Edmonton's eastern outskirts on the south bank of the North Saskatchewan River, the Gold Bar Wastewater Treatment Plant handles the waste water requirements for the greater Edmonton area. In one year, the treatment volume at the plant is roughly 100,000 million litres - enough to fill 37,000 Olympic-length swimming pools (more than 100 per day). 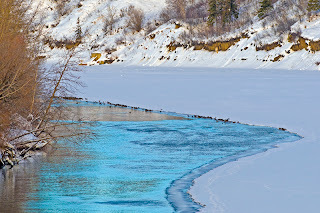 All this warm treated water flows in the river and keeps a sizable stretch of it from freezing. 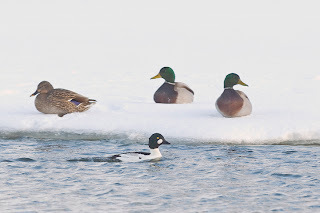 During the winter this stretch of water is home to 1000s of Mallards, a few Common Goldeneyes and, occasionally, some other waterbirds. This contained smorgasboard of course attracts predators. 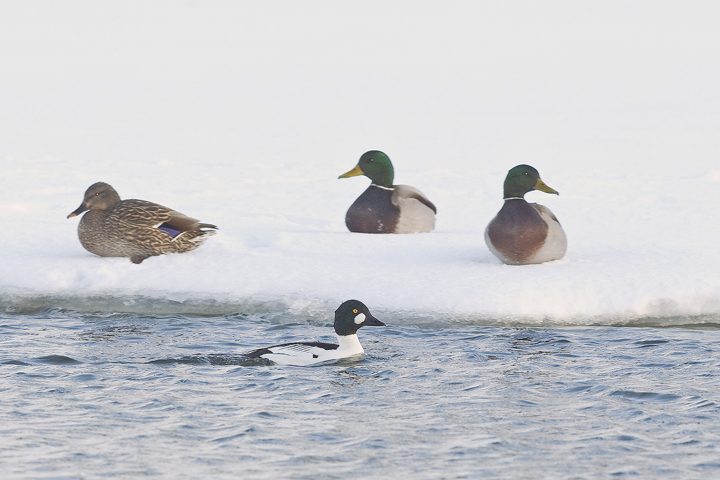 Several Bald Eagles and Northern Goshawks have taken up winter residence here and regularly dine on ducks. 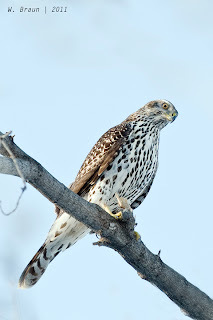 The Northern Goshawk (Accipiter gentilis) is the largest and heaviest of the three North American accipiters. Goshawks are larger than Sharp-shinned Hawks (Accipiter striatus). Male Northern Goshawks can be of similar size to female Cooper's Hawks (Accipiter cooperi), but Northern Goshawks have broader wings and a relatively short tail compared to Cooper's Hawks. The Northern Goshawk has a long tail with a broad, dark sub-terminal band and three to four narrower dark bands, rounded wing tips, and a conspicuous pale eyebrow. 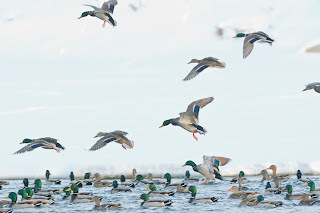 The sexes are similar with adults having a dark crown, blue-gray back, white underparts with fine, dense gray barring and conspicuous white undertail coverts. The eyes of adults are deep ruby-red and the feet are yellow. Immature Northern Goshawks are brown above, buffy below, with dense, blurry streaking. This aggressive predator is built to move quickly and quietly. It approaches its prey stealthily, moving unnoticed through dense cover, until it is close enough to overcome its prey in mid-air with a burst of speed, or drop out of a tree and swoop down on ground-dwelling prey. The are opportunistic feeders, eating a wide variety of prey. 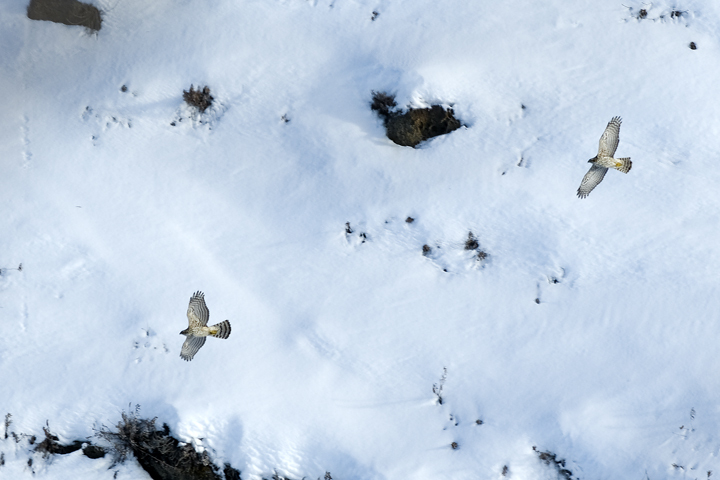 Squirrels, snowshoe hares, grouse and medium to large songbirds are all potential prey of the goshawk. 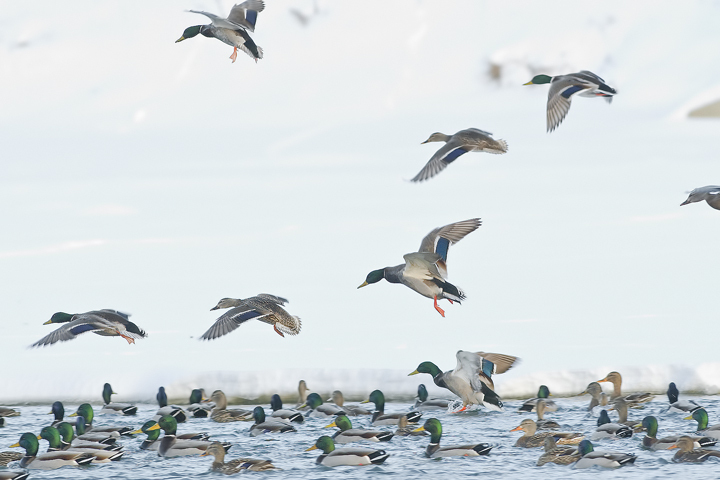 In Goldbar, Mallards are the overwhelming protein of opportunity.